It’s happening – and it starts in a month’s time! Put the dates of Kent Green Hop Beer Fortnight in your diary: Fri 25 Sept to Sun 11th October. Yes it’s a bit longer than a Fortnight because we want to extend the joys of Kent Green Hop Beer as much as we can! Launch Weekend: As usual it all kicks off at Canterbury Food & Drink Festival from Fri 25th to Sun 27th September. We’ve got a bigger tent this year and we’ll also have green hop beer-infused smoked brisket and ribs for you – courtesy of chefs from the Foundry Brewpub. NEW for 2015: West Kent Green Hop Festival at The Poacher & Partridge in Tonbridge, 2 – 4th October. 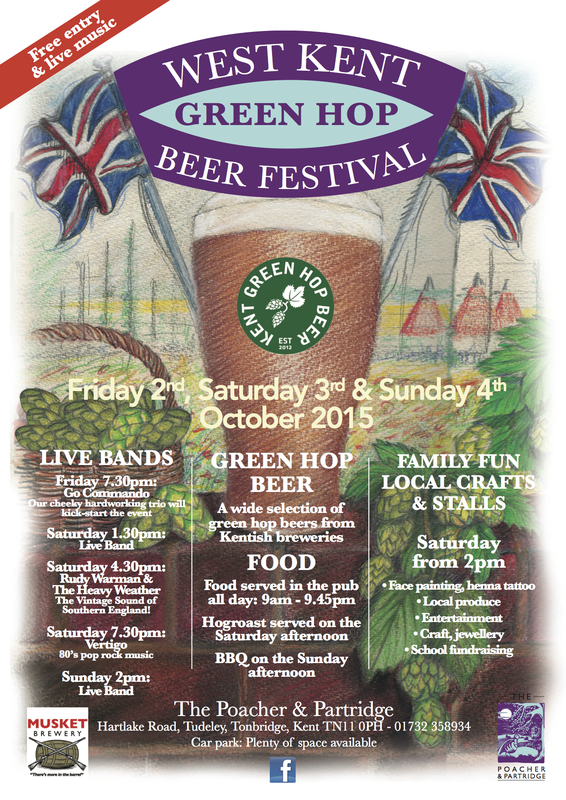 Music, dancing, food, craft stalls and – most importantly – a wide selection of Kent Green Hop Beer! More details to follow. 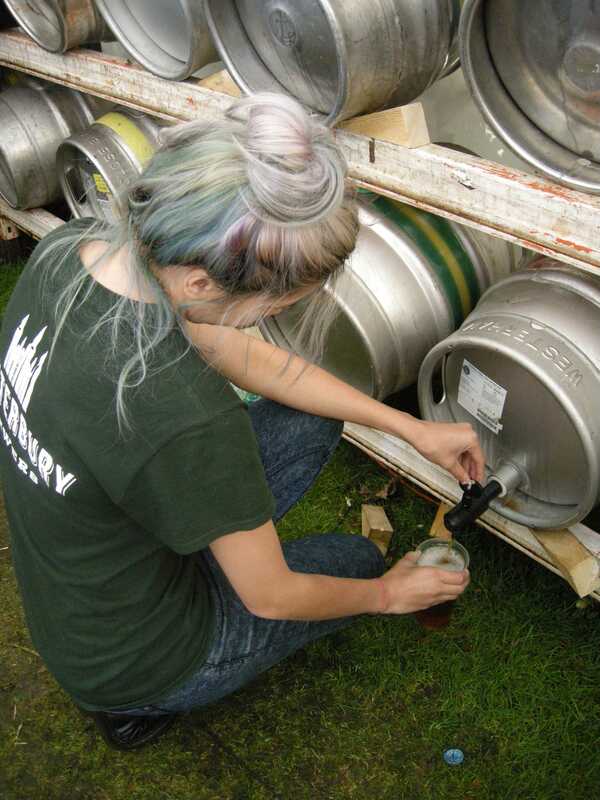 Returning for 2015: East Kent Open Day (Sat 10th Oct) – where Gadds’, Goody Ales, Wantsum Brewery, The Foundry Brewpub and Canterbury Ales open their doors to the public (noon – 9pm) and various buses will take punters from brewery to brewery to drink green hop beer and meet the people that make it. You can also find Kent Green Hop Beers at Broadstairs Food Festival 2-4 Oct and CAMRA’s Spa Valley Railway beer festival 23-25 Oct.
News of the brews: Some 27 breweries are expected to make a Kent Green Hop Beer this year. Here’s a round up of some of their plans. Caveman Brewery, betwixt Dartford and Gravesend, will be making three green hop beers this year, including the new Swanscombe Woman – which is named after the skull found in the former Barnfield Pit quarry (now Swanscombe Heritage Park). It will be a 4.7% hoppy brown ale, brewed by Helen Farrow who’ll be using Bullion hops – an old English variety which has been quite successful when grown in North America and is now being grown again in Kent. Larkins Brewery in Chiddingstone (west of Tonbridge) make their green hop beers with the produce of their own hop garden! Green Hop Best (4%) will feature Goldings and Bramling Cross and last year won Champion Beer of the Festival at the 2014 CAMRA/Spa Valley Railway event in Tunbridge Wells. Musket Brewery of Linton (near Maidstone) are brewing twice as much of their Flash in the Pan as they did last year. Being a small brewery that means just 40 casks… didn’t we always tell you Green Hop Beer is an exclusive, get-it-while-you-can drink? The Foundry Brewpub, Canterbury – leading lights and one of the founders of KGHBF – are going mad for green hops as usual. They’ll be making four different beers including Green Chapel (4.6%) in collaboration with Christ Church University as part of its Beer, Bread and Honey project – through which it will growing its own food, herbs and hops, keeping beehives and baking in a community bread oven. Goacher’s Brewery in Maidstone are launching a new green hop beer for 2015, previously having made a green hop version of their Silver Star. Look out this year for Goacher’s Green Hop Ale (3.9%) a pale ale, late hopped entirely with green East Kent Goldings. If you haven’t received this by email sign up for alerts (see box top left of page) so you don’t miss out on our features, news, updates on where to drink and … the 2015 beer list. All of which will be posted in the coming weeks. Now you can start crossing off the days till Kent Green Hop Beer Fortnight begins!